Our last sail of 2014 did not go smoothly. First we messed up the furler, we manually unwound the jib and put it in a state where it couldn’t be taken down, then somehow managed to substantially bend the boom. Having an unsailable boat has been a constant weight on my psyche through an already too-long winter. I was hoping that our marina would be able to find a replacement boom, but as the days have grown longer, I’ve started having visions of standing in the marina parking lot in late spring, watching other boats sail away while I quietly weep by my bent spar. It was time to take matters into my own hands. And I had a boom 6 hours later. Throughout our boating careers, our decision making process has consisted largely of long periods of relative inactivity with individual moments of brash decisiveness. I have previously referred to this as the “whirlwind of chaos that typically surrounds our major purchases,” considering incidents like the initial transport of Fortuitous I (see Fortuitous != Fortunate, Attempt #2, and Why Sailors are Superstitious, as examples). For better or worse, and probably the latter, this has begun to feel like the correct way to do things. While the boom was thankfully (and surprisingly) not a major purchase, I did buy it on eBay and offer to go pick it up immediately…in New Hampshire. My weather guy was talking about rainfall amounts using integers, which is never a good sign, but I was already in the passing lane on the New Jersey Turnpike before I even got directions to the seller’s house. Google was telling me in no uncertain terms not to take 95 above New York City, which is about the only way that I know of to get to points north, but I was going for speed and opted to follow the circuitous path through the back woods of Connecticut and Massachusetts. Despite the above-freezing temperatures and rain, the ground was still covered with snow—and so was the turnpike from Stockbridge to Boston, though the Berkshires seemed dreamlike on account of that frostin’. I eventually wound my way up into southeastern New Hampshire, found the seller, and bought it. Of course, it was slightly too big to fit in the truck. I secured it to the truck’s hardpoints using a bowline and trucker’s hitch and used a relatively loose bungee to keep the aft hatch closed. 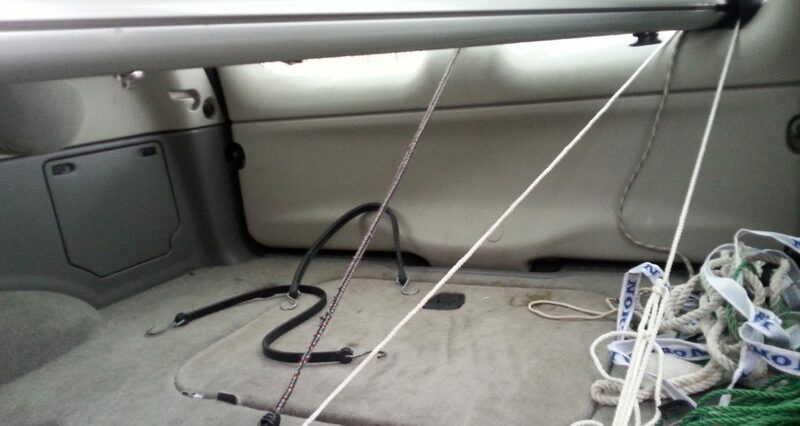 I always have a collection of ropes and tie-downs in my truck, but having left with very little forethought that morning, I didn’t bring anything to pad the boom-to-glass interfaces. The only things I could find were my gloves and toque, so I made do. It remains to be seen whether or not my hat sacrificed itself in the process…it was a long drive back and it became saturated with rain water and road grime. Jen is going to give it a wash with the delicates and we’ll see what happens. While my previous assertion that I had the boom within 6 hours was technically accurate, at the moment that I took possession I was well into the Granite State and still had another 6 hours to go to get it home. Driving with the hatch open for that long was annoying and the cargo area of my truck got soaked in the process, but the heater mostly kept up despite the dropping temperatures. It was raining and misty with areas of dense fog, so I ignored Google and stuck to the interstates, counting on vague memories of past road trips and a general affinity for anything heading south. I thought that I’d get a chance to catch up on my podcasts, but the music was too good and I used the time to listen to a lot of albums in their entirety, as albums were meant to be heard. I was tired and a little stiff after 12 hours and 700 miles of fairly intense driving, but even factoring in two tanks of gas, this boom was still cheaper (yet in better shape) than anything else I’d seen or been offered. I have every confidence that the snap decision to go was the right one, given the prototypically fortuitous nature of the adventure, and it’s immensely comforting to know that Fortuitous is ready to ride again. LOL. It’s never easy is it? Glad to hear you’re back in business. Got to get in the repair mode myself, but it won’t stay warm enough for epoxy to cure. Over the course of the last several weeks, I’ve spent an enjoyable several hours reading every one of your blog posts. You are a very good writer, and I love your sense of humor. When I first started sailing a number of years ago, I too kept a personal log of each outing. It was informative to go back several years later to read some of my first entries. I have found that you don’t realize how much you’ve changed in some regards until you compare yourself to an earlier point in time. And what better way to do that than keep a journal? Other people seem to sense those changes, but I guess we’re too close to it. I think perhaps you and I are alot alike in many regards, with one major exception – you have the courage to go out and DO something about your passion, plus you make a conscious decision to push your limits in order to improve. I enjoy the research phase of anything that interests me – I spend a lot of time at it. But when it comes time to put my money where my mouth is (like buying a boat! ), I tend to drag my heels. I think part of my problem is that I read many of the sailing magazines, and there’s a constant litany of problems encountered, things that break or wear out, etc. etc. Very off-putting. Part of me thinks that the fractional “time sharing” might be a better route to go – I’m not very handy and don’t enjoy repair projects. But there’s nothing very close to me (CT), and the programs that are out there seem to have larger boats than I’m comfortable with. I’ll likely mostly be single-handing. I’m semi-retired, so can go out during the week. My wife gets seasick if she notices ripples in her water glass at the dinner table as a truck passes by outside, so she won’t be sharing the sport with me. Wow – enough about me. Anyway, thank you for keeping up with your blog. I look forward to each new installment. Thank you for your kind words, Steve. It's great to hear that other people are getting something out of our boat log. Best of luck in your quest. Embrace the whirlwind of chaos!